I remember the first time I ate coleslaw. It was very long time ago, I went with my friend Ms. Ds to the cinema, but we decided to eat something first. She proposed KFC. Since fast food chains wasn’t present in Poland when I was a kid, I actually didn’t know what exactly KFC was. Only knew that they serve chicken. She convinced me to order the Kentucky Menu, which includes of course, coleslaw. Since my 4th love is Ms Cabbage I didn’t deliberate any longer, and started chowing it down. I found out that I’m in love with the idea of the tiny shredded cabbage in a creamy dressing. Of course we make cabbage salads in Poland 0_o but none of the versions I ate previously was as good as this one. Some years passed, visited KFC from time to time, and always ordered coleslaw. I liked it so much that through years I tried to reconstruct this flavour at home. I failed of course cos I didn’t have any idea what ingredients are in the dressing. I believe the original recipe is locked in the KFC HQ in Louisville along with the chicken spices mix recipe 0_o. The first success came when I met Cookies, and he told me what should be in traditional, homemade coleslaw. Now I don’t try anymore to reproduce original KFC one (always can go, and order it, right? 0_o). It’s because from that moment I reassembled the recipe my own style, which is very tasty, and Cookies sometimes begs on his knees that I make it. Usually I give up easily cos I like it myself, and he promises the help with shredding cabbage :D.
Shred cabbage. If you use a hand grater, use the biggest edges. Grate carrots with the medium edges. Mince onion tiny, and to take the bite of it, keep for a minute in very hot water, rinse in cold water, and let it drain good. 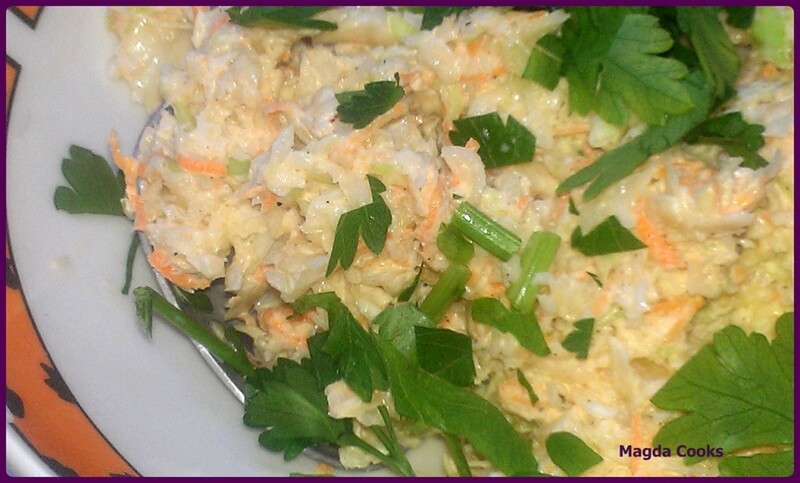 Mix cabbage, carrots, and onion, stir thoroughly. Sprinkle with salt, not too much though – cabbage will leak water. Which you can drain, but it’s not necessary. Preparing the dressing is just as easy – combine all the ingredients into a Boss Cup 😉 joking, any dish will do – though wooden barrel wouldn’t be okay I think 0_o. Whip it with a whisk. It has to be liquidy, yet creamy 😉 then pour the dressing over the cabbage, and again stir good. Put it into a plastic container, and refrigerate for at least a couple hours.